White crocheted doily, 4" - 6" diameter. Turn the margarine container upside down and cover with a plastic sandwich bag. Pour the fabric stiffener into a bowl. Dip the doily into the bowl, saturating it thoroughly. Wring out the excess back into the bowl. boiling equal parts of sugar and water until the sugar is completely dissolved. 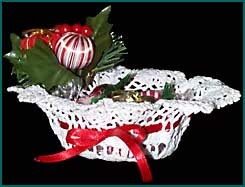 Drape the doily over the margarine container. Press down over the sides, but let the edges flair out. Set on the wax paper and allow to dry overnight. Thread the narrow ribbon in and out through the holes in the doily bowl. Leave both ends on the outside and tie together into a bow. If you want, glue a Christmas floral or other decoration to the side. Fill with candy and enjoy!